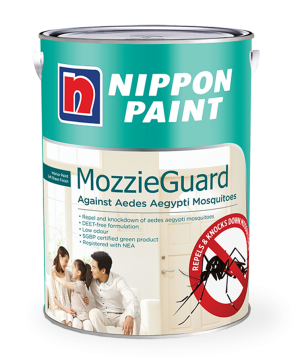 Nippon Paint MozzieGuard is a special coating with insecticide encapsulated in the polymer for interior use. The active ingredient within the paint enters the Aedes aegypti mosquito when it lands on the painted surface and disrupts the Aedes aegypti mosquitoes nervous system, leading to paralysis and mortality. By covering more surfaces with MozzieGuard, the probability of the Aedes aegypti mosquitoes landing on the paint film becomes higher, which increases the chance of knockdown on contact. MozzieGuard is a safe option, other than NEA Mozzie Wipeout campaign, to fend off the Aedes aegypti mosquitoes that spread dengue and Zika and provide protective benefits to you and your family.Note: MozzieGuard is formulated to be part of the dengue prevention move towards Aedes mosquitoes free community.